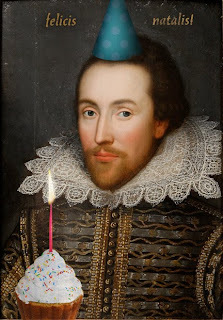 Every year in The Shakespeare Club we spend one of our meetings celebrating the Bard's birthdate of April 23, 1564. This year, we gathered in the school library to play games, watch DVDs and eat way, way too much sugar. With only four rehearsals left, I was reluctant to waste time partying, but it's a tradition and sometimes goofing off can be as productive as hard work. Rachel made forty cupcakes, each topped with white frosting and "SC" written in blue. Young Kate also brought forty cupcakes. To complete the menu, we had oranges and juice boxes. The library bounced big time. They love: The Insult Game. "Thou gorbellied reeling-ripe maggot pie!" "May thy lips rot off!" They loved being the insulter as much as the insultee. "Pick me! Pick me!" they screamed. "I do desire that we be better strangers." I've used it myself to great effect. They also love the Dictionary Game. One child chooses a word out of the dictionary and everyone makes up a definition. I read six definitions aloud, including the correct one, and they vote. Many kids chose Luis' definition of "minx": a dotor suss carchater. No one voted for: A flirtatious girl and Lyndon won for stumping the group. I closed the blinds, turned on the television and we watched the Simpsons' hysterical version of "Hamlet" and a second funny episode where Marge tells the story of Henry VIII. They clamored to see these twice and I hoped their laughter might whip the sugar through their systems lickety-split before the comas set in. We ended our party with juice boxes raised in a toast to William Shakespeare. As a member once said, "Without him, we wouldn't be here together!" I want to be in the Shakespeare club because it is going to in courage my bravery in the future and help get a better job in the future..